A new study on the feeding habits of ocean microbes calls into question the potential use of algal blooms to trap carbon dioxide and offset rising global levels. These blooms contain iron-eating microscopic phytoplankton that absorb C02 from the air through the process of photosynthesis and provide nutrients for marine life. But one type of phytoplankton, a diatom, is using more iron that it needs for photosynthesis and storing the extra in its silica skeletons and shells, according to an X-ray analysis of phytoplankton conducted at the U.S. Department of Energy’s Argonne National Laboratory. This reduces the amount of iron left over to support the carbon-eating plankton. Because of this iron-hogging behavior, the process of adding iron to surface water – called iron fertilization or iron seeding – may have only a short-lived environmental benefit. And, the process may actually reduce over the long-term how much C02 the ocean can trap. Rather than feed the growth of extra plankton, triggering algal blooms, the iron fertilization may instead stimulate the gluttonous diatoms to take up even more iron to build larger shells. When the shells get large enough, they sink to the ocean floor, sequestering the iron and starving off the diatom’s plankton peers. Over time, this reduction in the amount of iron in surface waters could trigger the growth of microbial populations that require less iron for nutrients, reducing the amount of phytoplankton blooms available to take in C02 and to feed marine life. While scientists have known for a long time that phytoplankton use iron to fuel the process of photosynthesis, there are gaps in their understanding of how this iron cycling process works. Those gaps led scientists to miss how large an amount of iron was getting trapped in those sinking skeletons and removed permanently from the food chain. X-ray studies at the Advanced Photon Source at Argonne gave scientists a way to measure the ratio of iron and silica in the plankton and surface water. “Being able to use X-rays and see the element content of individual microscopic phytoplankton has completely altered our perspective on how these organisms use iron and how that could affect C02 levels,” Ingall said. 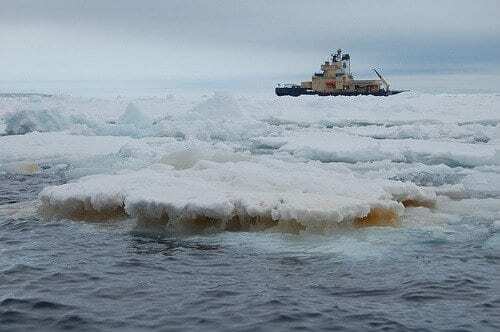 In the paper “Role of biogenic silica in the removal of iron from the Antarctic seas” published June 10 in the journal Nature Communications, scientists conservatively estimate that 2.5 milligrams of iron annually is removed from every square meter of surface water in the Ross Sea and sequestered in silica skeletons on the ocean floor. This is roughly equivalent to the total amount of iron deposited annually into the Ross Sea surface through snow melt, dust and upwelling of seawater. The same process may be occurring in the Southern Ocean and having a greater impact there, because this region dictates the nutrient mix for the rest of the world’s oceans through migratory current patterns. More study is needed to know just how much iron is used to make the silica skeletons and how much gets trapped on the ocean floor, the researchers said. “This gap in our knowledge, combined with renewed interest in iron fertilization as an approach to the current climate crisis, makes it crucial that we have an improved understanding of iron cycling in marine systems,” Ingall said.